From finding a home to financing one, we can help you from start to finish. Welcome to HomeAdvantage®...an exclusive, free member service for members that can help you search, buy, sell and save on your next home. 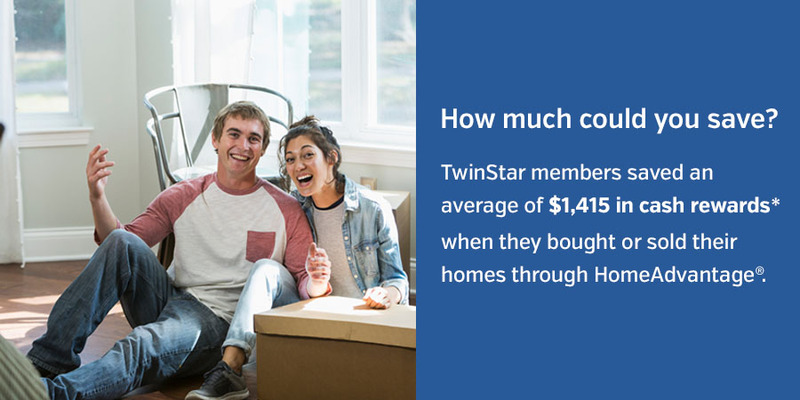 With TwinStar and the HomeAdvantage program, you have help each step of the way, including access to online MLS listings. Plus, if you work with an agent in our network, you can receive a special cash reward. * Visit a TwinStar Credit Union branch or click the button below to get started. Search through our online MLS listings to find the home you want that matches the options you need. Save your search criteria and get an email alert whenever new matching properties become available! 2. Connect with a trusted agent. Choose an agent from a network of experienced, hand-picked agents ready to help you buy, sell or both. Members that work with an agent in our network earn an average of $1,415 back in savings! Sign up with HomeAdvantage today and get a FREE Member’s Guide to Home Buying and Selling! *The HomeAdvantage program is made available to members through a relationship between TwinStar Credit Union and CU Realty Services. Program cash rewards are awarded by CU Realty Services to buyers and sellers who select and use a real estate agent in the Home Advantage network of approved agents. Home buyers or sellers are not eligible for the cash reward if they use an agent outside this network. Using TwinStar Credit Union for a mortgage is not a requirement to earn a cash reward. Cash reward amounts are dependent on the commissions paid to the agent. TwinStar Credit Union has specific rules on how your cash reward will be paid out. Cash reward incentives are available in most states; however, are void where prohibited by law or by the lender. Please consult with a TwinStar mortgage lending officer to get details that may affect you.